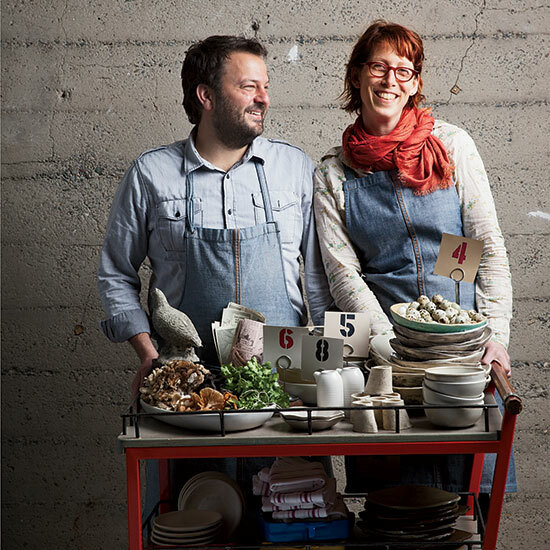 As they prepare to open their highly anticipated new San Francisco restaurant, The Progress, chefs Stuart Brioza and Nicole Krasinski offer a preview of their family-style, meant-to-be-shared recipes. Most chefs are good hosts; it’s the nature of their business. Stuart Brioza and Nicole Krasinski might be two of the best and most thoughtful hosts in the restaurant world. When guests sit down at their outstanding San Francisco spot State Bird Provisions, a dim sum-style cart—stocked with genius modern American snacks like just-fried garlic bread topped with burrata—rolls right up. “People come in with low blood sugar; if you bring them food right away, immediately everyone relaxes and all is right with the world,” Brioza observes. The focus at State Bird Provisions is small dishes; Brioza,a 2003 F&W Best New Chef, refers to the restaurant as “an hors d’oeuvres party.” When his and Krasinski’s eagerly awaited new restaurant, The Progress, opens this winter, it will emulate a dinner party. Little plates of pickles will be arranged on tables while guests have cocktails. Then platters of food will start arriving, like a magnificent sirloin roast with garlic chips and fresh hot sauce alongside accompaniments like sautéed mixed mushrooms with pickle butter. “Nothing—nothing—is more satisfying than sharing food,” declares Brioza. For platters big enough to serve these family-style dishes—and all the plates at The Progress—the chef is working with a local ceramist, Mary Mar Keenan. (Brioza met her a few years ago, when he was between jobs and began making pottery himself.) Keenan’s beautifully glazed pieces include an especially pretty golden plate decorated with white drops; it’s a lovely backdrop to Krasinski’s individual lemon-yogurt custards topped with colorful apple-and-cranberry salad. “You should always have something of your own that you don’t have to share,” she says. There are plans to sell Keenan’s work at the restaurant. This year, for the first time in ages, Brioza and Krasinski are planning to close their restaurants on Christmas Eve, so they can have a full day to prepare a Christmas Day dinner. When guests arrive at their home, the chefs will have snacks ready, like creamy, caper-studded trout dip with potato chips. Then they’ll serve a meal featuring dishes a lot like the ones on the following pages, with one important addition: cocktails. “Cocktails are key to every good party,” says Brioza. The Progress, 1525 Fillmore St., San Francisco; theprogress-sf.com.